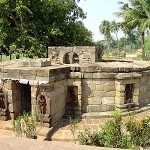 On the outskirts of Bhubaneshwar is Hirapur village with it Hypaethral Temple of 64 Yoginis. One among the two such distinguish temple in Orissa and four such in India it has beautiful Yogini images-a great study for the connoisseurs of art and architecture. This entry was posted in Orissa, Yogini. Bookmark the permalink.